Portfolios have the capacity to package student learning in ways that direct and support metacognitive thinking; when students habitually consider how they best learn and why, and practice communicating their understanding, they are better able to employ their own set of “best practices” as learners. Chappuis, Stiggins, Chappuis and Arter (2012) support this reasoning by telling us that “Collecting, organizing, and reflecting on their own work builds students’ understanding of themselves as learners and nurtures a sense of accomplishment” (p. 364) However, it is not enough to merely collect student work in an undifferentiated folder; this is what Chappuis et. al. (2012) refers to as a working folder. Instead, students must be lead through the process of reviewing, sorting, selecting and deconstructing tangible evidence of their learning to gain insight. While this is a tall order, Figure 11.2 Portfolio Decision Flow (p. 366) provides a seven-step progression that leads educators and in-turn, students, through this process. I think it will be helpful for me to examine my past experience and practices with portfolios using these guidelines; this will provide direction for a more effective means to create portfolios that “…offer a rich and detailed view of their subject’s characteristics or qualities” (Chappuis et. al, 2012, p. 364). 1) What kind(s) of portfolios will we assemble? What story do we want to tell? Given Chappuis et. al. (2012) description of portfolios, I believe that ours were a combination of growth and celebration portfolios. Students were encouraged to select items that they were proud to share as well as items that demonstrated a continuum of development in proficiency, whether it be mathematics, language arts or another content area. Now: I want students’ portfolios to tell their unique story; their struggles, triumphs, leaps forward and steps back; this would be best in a growth portfolio. I can envision creating a project portfolio that documents a students’ search to gather, analyze and synthesize information on a point of inquiry using the I-Search process. Achievement portfolios could be useful for conferences and would contain the most recent documentation of student achievement leading up to conferences; this would be an excellent catalyst for personal goal setting. Competence portfolios are a bit more difficult for me to imagine at the middle school level, but perhaps this could be an end-of-year body of evidence demonstrating proficiency, for example, in Six Traits Writing. Celebration portfolios definitely have their place in any classroom; sometimes students just don’t have an opportunity to focus on their strengths. Or, maybe they need help identifying just what it is that they’re really good at, or proud of. A portfolio of this nature would be about building resilience and good memories. 2) Which learning target(s) will be the focus of our portfolios? Then: An explicit correlation to learning targets (standards) was not the defining role of student portfolios at this school. Teachers were told, by our Primary Years Program (PYP) coordinator, that we were to have students select artifacts, around three, from each of the content areas; mathematics, language arts, units of inquiry, art, PE, music and Mongolian language to place in the portfolio. We were to encourage students to select items that were a good reflection of their growth in these subjects throughout the year. I would typically set-aside a day here and there, as I found time, to work on collection of artifacts and self-reflection. It was by no means a deliberate part of my teaching. Now: It is clear to me that nearly everything that happens in a classrooms must eventually come back around to the learning targets that are based on standards. This must guide the written, taught and assessed curriculum; without this roadmap, learning occurs in disconnected bits and bobs and can never truly reach its’ fullest potential. Depending upon the purpose of the portfolio, and hence, the kind of portfolio, I could conceivably include disposition targets as well. However, I would only do this if I had explicitly included disposition targets as part of my taught curriculum; they may not be assessed, but there is still value in reflecting upon the interaction between disposition and achievement. 3) Based on purpose and target(s), which pieces of evidence will we include? What are our guidelines for inclusion? How will we ensure a representative sample of student work? Then: Students were given somewhat of a free rein to sort through their work (kept in content-specific folders for this purpose) to choose what they considered appropriate examples of their learning continuum. I circulated throughout the room providing feedback and answering questions. Some students were quite diligent selecting pieces of work that demonstrated development towards proficiency, others were not a discerning. Specialist teachers, and myself, included some mandatory pieces; for example, work from our Exhibition unit was always included in the final portfolio. Now: I think that I would use more peer support in determining appropriate evidence to include in portfolios; I have found that most students tend to be honest in kind ways and will help their peers get it right without hurting feelings. However, this type of discussion requires a delicacy and tact that younger students (thinking about my Grade 6) would benefit from being explicitly taught; my older students always benefit from a gentle reminder. To ensure a representative sample of student work, I think that I would have to be involved in the selection of work as well. There may be some formative or summative assessment items that would be required. I would also make sure that portfolio work would be an integral part of the curriculum with intentional planning of time and opportunities for self-reflection to occur. 4) What kinds of annotations will students make on each piece? Then: This is an example of the types of self-reflective prompts provided to my Grade 5 students. 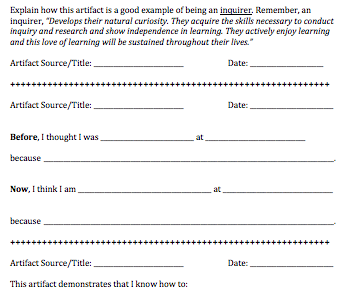 Many students chose to use these prompts while others chose to structure their own free-write thinking dependent upon their enthusiasm for a particular artifact. Now: Prompts would be targeted to specific learning targets that would be student friendly versions of our standards. I would have to be organized in providing a running list of learning targets for students, or I could post them on the class website, for use during portfolio artifact selection and reflection. 5) What kinds of reflection on the overall contents will students engage in? Then: None! There was no synthesizing narrative written or oral presentation given. Now: I can see that a final metacognitive reflection on the various component parts of a students’ portfolio would bring a higher level of understanding to their process as a learner. I can’t believe that I hadn’t thought of this before. I can’t change the past, but I can make sure this happens in the future. 6) When and with whom will we share the portfolios? Then: Students shared their Portfolios with their parents, during student-led conferences towards the last quarter of the school year. This was a long and tedious process, even though students practiced talking about their artifacts with a partner a few times before conferences. I think the quantity of artifacts detracted from the story that was trying to be told, and both students and parents were overwhelmed. Now: Again, the answer to this question is very much tied to the purpose of the portfolio. Since I can imagine useful application of each kind of portfolio, parents, the school community at-large, and the student themselves would all benefit from the insights present in this work. 7) How will we organize the materials? Then: Students created a table of contents with content area and artifact name. This seemed to work fairly well, except the portfolio itself contained static, clear sleeves; they were not in a binder that could be opened and closed to try-out different configurations. Instead, if a piece for language arts had to be put into the portfolio and there wasn’t an empty slot in the language arts section, then everything to the left or right had to be removed and moved over. It was beyond tedious. Now: I like the idea of clear sleeves to keep work safe and clean, but I would definitely be a proponent of three-ring binders and removable sleeves! Better yet, I would prefer a totally digital portfolio. I would have to train students in the use of a digital classroom camera and storage of artifacts, but this expectation of archiving work could be taught at the beginning of the year with frequent reteaches. This would truly create a sense of responsibility and ownership for students as they become the architects of their portfolio. Everyone knows someone that is a master storyteller. Timing, inflection, pacing, and eye contact all play a role in conveying a good story; they have the power to inspire or the power to soothe. It is the delivery that evokes tangible and provocative reaction; it is through the good telling of a story (not telling a good story) that captures our imagination and takes us place we never knew we yearned for. I want my students’ portfolios to take them, and those that they share them with, on a journey filled with struggle and hope, setbacks and comebacks, and eventual self-discovery. It is through the transparent telling of our own stories that we learn who we are and communicate who we want to be. This self-aware, and reflective learning is what I want for my students. This entry was posted in EDU 6613-Standards Based Assessment, Standard 05. Assessment and tagged Achievement Portfolio, Celebration Portfolio, Competence Portfolio, Growth Portfolio, Portfolios, Project Portfolio, self-reflection, student self-assessment. Bookmark the permalink. Just when I think that we are winding down, you take something on a really great walk… this blog could serve as the basis for talking about portfolios with fellow teachers and administrators. You set this up in a way that really shows your growth in both concept and disposition. I agree that the digital portfolios will be great when students can run them, and it is surprizing how adept they will be. My son has been using an online art portfolio for several years for his crazy drawings. He loves it. He’d be really happy to show his friends how to use the site. All it takes are a few experts, and things start really moving. It’s crazy how fast kids adapt to ipads, and that is a tool well suited for students to use in efolio production.